A Finnish online bank used to include a US-based third-party analytics and tracking script in all of its pages. 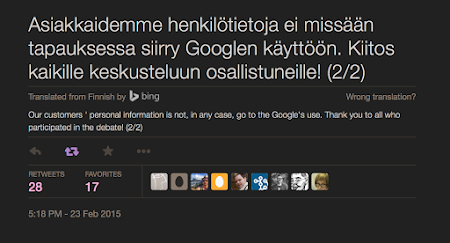 Ospi first wrote about it (in Finnish) in February 2015, and this caused a bit of a fuss. As Ospi notes, a plethora of information is sent along the HTTP request for the tracker script. This includes, of course, the IP address of the user; but also the full URL the user is browsing. The bank's URLs reveal quite a bit about what the user is doing; for instance, a user planning to start a continuous savings contract will send the url continuousSavingsContractStep1.do. I logged in to the bank (using well-known demo credentials) to record one such tracking request. The URL sent to the third party tracker contains a cleartext transaction archive code that could easily be used to match a transaction between two bank accounts, since it's identical for both users. But there's also a hex string called accountId (highlighted in red). It's 40 hex characters long, which is 160 bits. This happens to be the length of an SHA-1 hash. Could it really be a simple hash of the user's bank account number? Surely they would at least salt it. The demo account's IBAN code is FI96 3939 0001 0006 03, but this doesn't give us the above hash. However, if we remove the country code, IBAN checksum, and all whitespaces, it turns out we have a match! This is a BBAN format bank account number. BBAN numbers are easy to brute-force, especially if the bank is already known. I wrote the following C program, ~25 lines of code, that reversed the above hash to the correct account number in 0.5 seconds. In conclusion, the third party is provided with the user's IP address, bank account number, addresses of subpages they visit, and account numbers associated with all transactions they make. The analytics company should also have no difficulty matching the user with its own database collected from other sites, including their full name and search history. Incidentally, this is in breach of the Guidelines on bank secrecy (PDF) by the Federation of Finnish Financial Services; "In accordance with the secrecy obligation, third parties may not even be disclosed whether a certain person is a customer of the bank" (pg 4) (sama suomeksi: "Salassapitovelvollisuus sisältää myös sen, että sivullisille ei ilmoiteta edes sitä, onko tietty henkilö pankin asiakas vai ei"). The script was eventually removed from the site, leaving the bank regretful that such a useful tool was lost. However, alternatives do exist (like Piwik) that can be run locally, not involving a third party. Edit: The Intercept, a news website, is using non-privacy-invading metrics. S-Pankin arkea on Twitter: "Asiakkaidemme henkilötietoja ei missään tapauksessa siirry Googlen käyttöön. Kiitos kaikille keskusteluun osallistuneille! (2/2)"
Wow, is this even allowed in Finland to pass such personal information to a third party without consent? The Guidelines on bank secrecy (PDF) by the Federation of Finnish Financial Services (Finanssialan Keskusliitto) recommend that an explicit power of attorney be issued to authorize such information transfer (8.2). Also - "In accordance with the secrecy obligation, third parties may not even be disclosed whether a certain person is a customer of the bank." This was clearly broken. Can you tell us more about how such a "well known test account" works? It looks exactly like the actual online bank, but any transaction you make isn't actually realized in the backend and there's no real money involved. How about if.fi? Same problems? They don't seem to have an online bank. Eka kuva on linkki twiittiin.